As of December 14, 2017, the Swan Lake Provincial Park campground will offer campsite reservations via our Discover Camping Reservation Service. a grassy campground and day-use area, baseball diamonds and playground area. All campsite reservations must be made through Discover Camping. When reservations are not available, all campsites function as first-come, first-served. Located 35 kilometres southeast of Dawson Creek, 2 km gravel access off Highway #2. History: Established in 1918, it has the distinction of being British Columbia’s third oldest park. Conservation: Swan Lake Park provides representation of the Kiskatinaw Plateau ecosection and is covered by the boreal white and black spruce biogeoclimatic zone. Vegetation consists predominately of trembling aspen, balsam poplar, white spruce and willows. 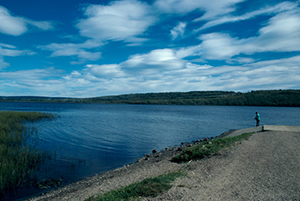 Swan Lake is the largest water body in the Alberta plateau. The maximum depth is 7.6 metres and the mean depth is 3.1 metres. Wildlife: The occasional moose and white tail or mule deer may pass through the park. However, black bears do frequent the area. Muskrat and beaver can be seen around the lakeshore and the Tupper River which drains into the lake through the park. If you are interested in bird watching, an abundance of waterfowl and migratory bird populations congregate at Swan Lake. An example of birds that frequent Swan Lake include common loon, red-necked grebe, western grebe, trumpeter swan, American widgeon, sandpipers, bufflehead, coot, gulls, eastern kingbird, warblers, blackbirds, killdeer, hooded merganser, red-eyed and warbling vireo, hermit thrush, swallows, yellowlegs, scoters, lesser scaup and goldeneyes, just to name a few. Swan Lake is popular with local anglers. Sport fish include walleye, northern pike, yellow perch and burbot. Northern pike spawn in the spring among lakeshore weeds. Yellow perch, which have been stocked, are also weed spawners, but spawn later in spring. The lake is too shallow and too warm to support cold water salmonid species such as trout and char. Swan Lake provides excellent opportunities for canoeing and kayaking. Watch out for motorized boats. No rentals available in or near the park. Anglers can try their luck fishing for walleye, northern pike, yellow perch and burbot. Anyone fishing or angling in British Columbia must have an appropriate licence. There are developed trails at this park. For your own safety and preservation of the park, obey posted signs and keep to designated trails. Shortcutting trails destroy plant life and soil structure. There is a boat launch and dock at Swan Lake Park that is open year-round. Be aware that during the camping season the gates are closed from 11pm to 7am, daily. There are pit toilets in the campground, and also in the day-use area. There are playground facilities at this park.